As the result of cooperation with SOLIDAR, on 15 June at General Assembly, IRIS Network entered the membership of this European network of NGOs working to advance social justice in Europe and worldwide. During 4 years of cooperation SOLIDAR supported IRIS Network trough capacity building, policy and advocacy activities. Few of our many common activities are: organizing traineeship and fellowship programs for IRIS members, participation on panel discussions within the European round tables which became voice of IRIS in EU, as well as monitoring the progress of the integration of the Western Balkan states in fields such are: employment policies, education and lifelong learning, anti-discrimination policies, active citizenship and social economy. IRIS members are participating in SOLIDAR Academy as well as in other programs and projects of common interest. SOLIDAR has 60 member organisations based in 27 countries (22 of which are EU countries) – national NGOs in Europe, as well as some non-EU and EU-wide organizations. 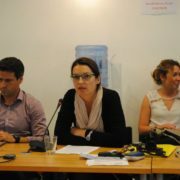 SOLIDAR voices the concerns of its member organisations to the EU and international institutions by carrying out active lobbying, project management and coordination, policy monitoring and awareness-raising across its different policy areas. SOLIDAR was founded in 1948 to encourage international cooperation between social aid organisations connected to the labour movement. First know as International Workers’ Aid the organisation set up its headquarters in Brussels in 1995 and was renamed SOLIDAR.